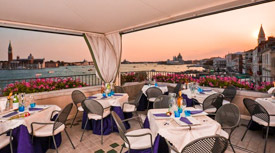 The Locanda Vivaldi is a four-star, 27-room boutique hotel on the Riva degli Schiavoni, facing St. Mark's Basin. Amenities include a roof terrace, an indoor-outdoor bar and restaurant, and accommodations that range from standard double rooms to junior suites. If you like the idea of a luxury hotel on Venice's waterfront but can't afford the Danieli or the Metropole, the Locanda Vivaldi won't leave you disappointed. The Locanda Vivaldi will be on your left, just after the bridge. Cross the stone bridge to the Locanda Vivaldi (which will be on your left at the foot of the bridge).